We had a little silent but a very interesting Barcamp on Saturday. I call it silent because there wasn’t any live blogging :). Despite our best efforts to get the wifi up & running we could not manage to do it due to networking/proxy issues :(. If you are infuriated with that then you could direct the brickbats here! Some felt that the attendance looked very sparse but when counted on the registration desk there were about 150+ registrations. It looked sparse because we were housed in a very large room (actually two rooms merged into one room). We had various talks which ranged from overview of the mobile space, the promise of mobile, how changes in this space are creating opportunities to uproot dinosaurs (called telco’s) of our age, on how the understanding the dynamics of a mobile can help us come up with innovative application for day to day life, how mobile technology & applications has the potent to really bridge the rural urban divide. On the overall it covered a wide range. 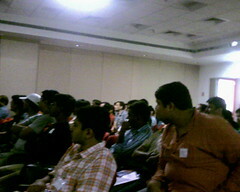 Some thoughts on/after Barcamp Hyderabad that came to my mind. The alpha geeks of the PC world are not the alpha geeks of the mobile world. IMO the mobile pre adopters are the 10-17 year old kids who got a smartphone as their birthday gift. I was surprised & amazed as to how many of these geeks who grok out for developing code for PC even know how to get around installing a simple application in a Nokia 6600 or a J2ME phone. Lessig Style of presentation is really catching up and many are jumping to 2.0 style in presentation. Atul gave a presentation where he used the lessig template and old typewriter font (I just love to use that P22 Typewriter font) but his style was much slower than the original lessig style. He had given a really wonderful presentation. Very rare is that you find a techie/geek who can speak in normal people’s language and not speak the l33t speak. His points were very good but after a while (actually a long while) the audience grew restless because they felt like being hammered with the same two points. A statistic that was shared that we are 1 billion phone in the world and very soon we are going to have about 2 billion phone. I read recently that the actual number is that we have quietly crossed the 2.5 billion cellphone mark already. While spending time organizing things around missed out on meeting a lot of folks and also missed out on a couple of interesting talks. Should make sure from next time onwards that I do not miss lot of the talks or meeting with new folks.